RAMSEY, NJ--(Marketwired - May 29, 2013) - Konica Minolta Business Solutions U.S.A., Inc. (Konica Minolta) today announces the launch of the bizhub® C554e/C454e Series of Color Multifunctional Products (MFP -- print, copy, scan and fax all in one system). 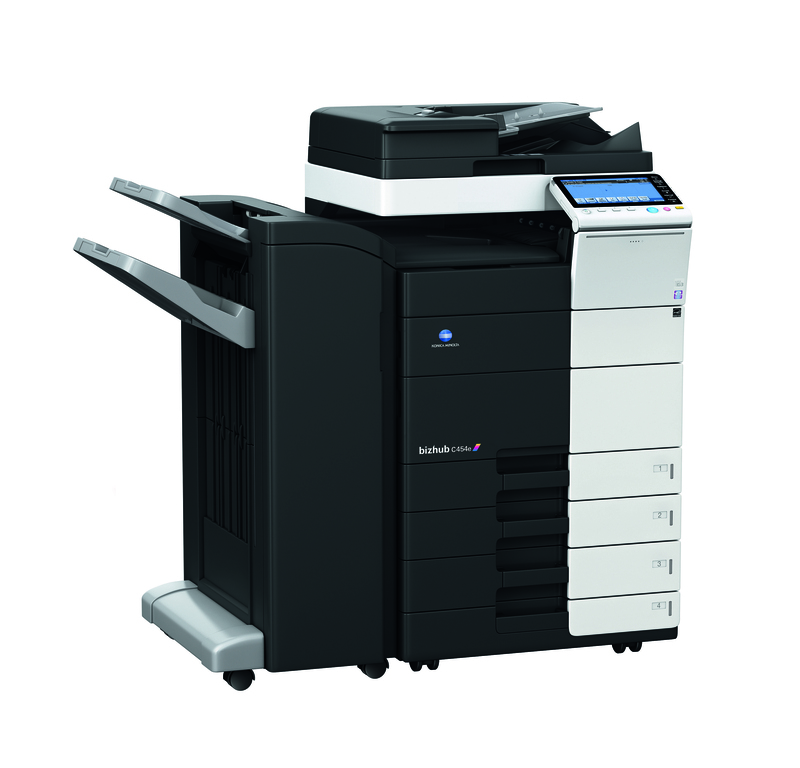 Featuring Konica Minolta's award-winning INFO-Palette design, these high-speed, high-volume print/copy/scan MFPs are considered enhanced versions of their predecessors (bizhub C554/C454) and offer broader accessibility, more effective communication, improved information sharing and energy savings. The series is ideal for a broad range of users, including medium to large businesses; healthcare, education and legal customers with customization needs; and corporate environments with high-quality color output needs. With output speeds of up to 55 ppm and built in print control, this new series provides high-volume printing with pro-quality inline finishing options. The series also incorporates the latest evolution of INFO-Palette design with enhancements including: improved swiping; drag and drop; tap and toggle; pinch in and pinch out; as well as image rotation operations. 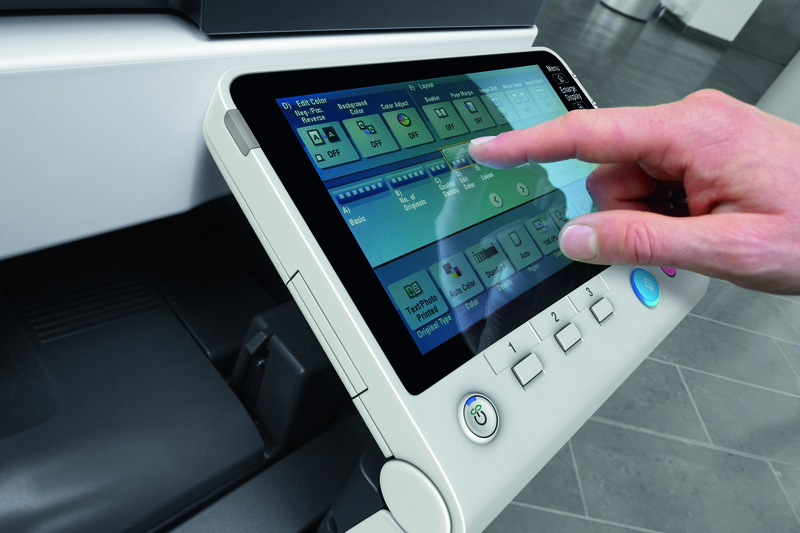 The control panel offers direct access to downloadable apps from the Konica Minolta bizhub MarketPlace®, and security has been expanded on these models, making them one of the first bizhub MFPs to comply with the IEEE 2600.1 international standard for MFP and printer information security as well as ISO 14001 international environmental standards. To reduce energy consumption, the series incorporates a wake-up function, which enables automatic answering for network communication. The result is a larger power shutdown area that reduces power consumption in sleep mode so that electricity is only provided to the area needed to wake up the device. This new platform consumes less than 1.0 watts during sleep mode and also improves TEC values. "We continue to improve upon the success of existing models to respond to what we hear from our customers and how we can better improve their workflow," says Kevin Kern, senior vice president, Marketing, Konica Minolta Business Solutions U.S.A., Inc. "As an enhanced series of MFPs, the bizhub C554e and bizhub C454e demonstrate how customers can count on Konica Minolta for solutions that are easily customized to their business needs with less impact to the environment." Click here for more information on the bizhub C554e/C454e series. Konica Minolta Business Solutions U.S.A., Inc. is a leader in advanced document management technologies and IT Services. The company focuses on complete business solutions including production print systems, digital presses, multifunctional products (MFPs), managed print services, vertical application solutions and related services and supplies. Konica Minolta has won numerous awards and recognition including being recognized as the #1 Brand for Customer Loyalty in the MFP Office Copier Market by Brand Keys for six years in a row. For the third consecutive year, Buyers Laboratory LLC (BLI) has named Konica Minolta as the winner of its "A3 MFP Line of the Year" award. In 2012, Konica Minolta also received "Document Imaging Solutions Line of the Year" recognition from BLI -- and has been named to the Dow Jones Sustainability World Index in recognition of the company's economic, environmental and social performance. For more information, please visit www.CountOnKonicaMinolta.com and follow Konica Minolta on Facebook, YouTube, and Twitter.